Participants of the Eurasian Economic Congress-2015. This year, the agenda of the Eurasian Economic Congress in Moscow was expanded for the first time, to include the Eurasian Economic Union’s cooperation with India, China and Arab countries. Moscow hosted the Eurasian Economic Congress (EEC) on December 1, at which participants discussed ways to improve trade between Eastern European countries and Russia. The Eurasian Economic Union (EEU) is a partnership effort by Russia, Kazakhstan, Belorussia, Armenia and Kyrghistan to “integrate” their economies by promoting mutual trade. This year the agenda of the congress was expanded: for the first time, the EEU’s cooperation with India, China and Arab countries was discussed during this meeting. This economic “integration” will result in a multi-polar economic space with increased business opportunities for all concerned. Participation of the seventh forum of the ‘India-Russia: Business-Dialogue’ was a key feature at this year’s Congress. The forum saw keen participation of the Indian business alliance in Moscow, the India Embassy and professionals from various fields. Speaking at the ‘India-Russia: Business Dialogue’, Ramnik Singh Kohli, head of Micromax in Russia, said Micromax had not experienced any bureaucratic delays in Russia and enjoyed a 7% market share in their segment of mobile instruments. He said all documentation was completed and Micromax was able to get operational within just 45 days from initiation of the process. He stressed the need for a B2B platform and said, while VTB and Sberbank are operational in India, there is a need for a better banking system. He sought government help to establish a “normal” banking system between the two countries. 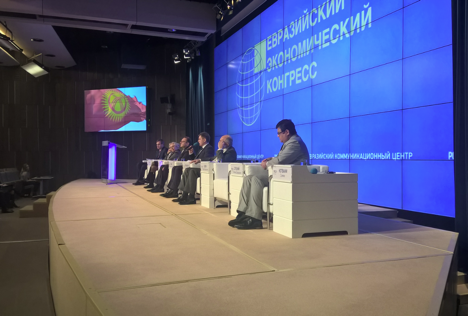 Vladimir Goshin, Minister in charge of Customs Cooperation of the EEC, said the single window custom clearance system which was currently being developed should be a breakthrough in Eurasian economic cooperation, bringing down paperwork and costs. D.C. Dass from the Indian Embassy in Moscow said India was poised for a promising future of bilateral trade. After Russian President Vladimir Putin’s visit to India in December 2014, and many high level delegations thereafter, there has been a rise in trade and a number of key agreements have been signed between the two countries, with others on the anvil. The Commercial Indo Bank (a joint venture of State Bank of India and Canara Bank) had started operations in Russia. There was immense scope for trade in the field of IT, pharma, tourism and medical tourism. A game changer, Dass said, would be the establishment of a dedicated freight corridor between the two countries. Participants expressed concern that, over the past 2 years, all contracts were in dollars despite the fact that the Indian rupee and Russian rouble were similarly volatile. India and Russia should orient themselves to trade in their respective currencies and not lose profit margins in dollar conversions. President of the Indian Business Alliance (IBA) in Moscow, Sammy Kotwani told the EEC that “Everyone makes mistakes,” alluding to mistakes made by both Russia and India in identifying their true “friends” and business partners. He said India was a “friendly neighbor” and would, in 2016, prove to be a leading business partner for Russia. Both India and Russia complement each other, Kotwani said, which could go a long way in furthering business relations. He said western sanctions imposed on Russia were a joke and more of a face-saver for the west and were not likely to have any lasting adverse effects on the Russian economy. The Indian Business community is excited about the upcoming visit of Indian Prime Minister Narendra Modi on December 24 to Moscow and feels it would give a fillip to the diplomatic and commercial partnership between the two countries. The introduction of the North-South transport corridor, part of the “Modi-fication” of how India does business with Russia and east Europe, is awaited. With the opening of the North-south corridor, goods will be transported from India, via Iran, Caspian Sea to Astrakhan reducing the transport time from the current 40 days to about 15-20 days. The corridor, expected to be in place in 2016, will be a major breakthrough in India-Russia business relations. Not only will it save time, it will also effectively reduce costs and increase access to Central Asian and East European markets. Gopal V Rajagopalan, General Secretary, IBA, said the Russian market had stabilized after its initial upheaval following the currency devaluation. The downward trend of the rouble has facilitated exports from Russia to other markets, including India, with demand for paper, timber and chemicals from Russia. Asked whether the Indian business community feels China poses a threat to Indo-Russian business relations, Rajgopalan said while it was not a threat, the advantages which China has cannot be overlooked. Bigger Chinese players in the Russian market were able to offer long term credit and attractive payment schemes, which Indian companies were not able to match. Most Indian companies doing business in Russia were traders or agents without the financial spine that support larger companies. Rajagopalan said Indian businessmen were themselves responsible for their poor image in the Russian market. Strict adherence to deadlines and quality control is ensured while exporting to the west, but when it comes to the Russian market, a disregard for time frames and laxity has been observed. This could be because of the historical bonhomie of “Hindi-Russi bhai bhai” (India, Russia - brothers) or because of a non-competitive market. This lower level of competition in the Russian market has resulted in establishing stable and substantial profit margins, making Russia a desirable market for Indian business. Rajgopalan also pointed out that the “Krisha” fee (meaning roof or protection) for doing business in Russia was more of a myth as President Putin’s iron glove policies had brought illegal practices to a halt. Despite corruption, which was still rampant, he expressed confidence in the Russian system and its answerability in meeting deadlines: “If all documentation was followed to the letter, then deals go smoothly,” he said.